(RxWiki News) Whole-body cryotherapy may not be so cool after all, according to the US Food and Drug Administration (FDA). Whole-body cryotherapy (WBC) takes cryotherapy, which is “super-cooling” of the body, to the next level. With WBC, a person will sit or stand in a chamber and will be exposed to very low temperatures. Despite the claims many WBC spas make, evidence on how WBC allegedly treats several conditions is lacking, according to the FDA. During a WBC session, a person will sit or stand in a chamber in which his or her body will be exposed to vapors that reach very low temperatures that range from negative 200 to negative 300 degrees Fahrenheit. The session will last for two to four minutes. Some cryotherapy sessions will require the body to be exposed while the head remains above the chamber. 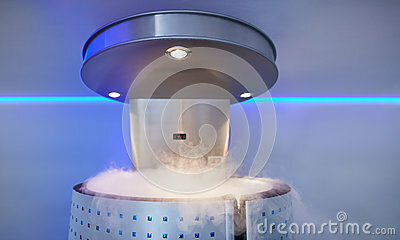 In other types of cryotherapy, a group of people will sit or stand in a totally enclosed chamber while the entire body, including the head, is exposed temperatures generated by liquid nitrogen. Currently, WBC is typically advertised to benefit those with any of several medical conditions, such as Alzheimer's disease, anxiety, depression, asthma, trouble sleeping, fibromyalgia, chronic pain, multiple sclerosis, migraines, osteoarthritis, rheumatoid arthritis and weight loss. Companies that sell WBC devices or operate WBC spas often claim WBC even helps to improve blood circulation, increase metabolism, relieve joint/body pain and help with recovery after a workout. But before you book a WBC session, there are a few risks you should be mindful of. What Are the Potential Issues with WBC? Whether WBC effectively treats the medical conditions mentioned is not confirmed due to lack of evidence, according to the FDA. In other words, the FDA has not cleared or approved WBC devices as a treatment of any specific medical conditions. The FDA is also concerned about patients who undergo WBC treatment, especially when WBC is used as a substitute for medical treatment options that are known to be safe and effective. WBC may not be effective, and it may even worsen your condition. In fact, what exactly happens to the body when exposed to very cold temperatures in this fashion is unknown, according to Dr. Anna Ghambaryan, an FDA scientific reviewer. She said in an FDA statement that she does, however, note the potential risks. "Potential hazards include asphyxiation, especially when liquid nitrogen is used for cooling,” Dr. Ghambaryan said. "The addition of nitrogen vapors to a closed room lowers the amount of oxygen in the room and can result in hypoxia, or oxygen deficiency, which could lead the user to lose consciousness. Moreover, subjects run the risk of frostbite, burns and eye injury from the extreme temperatures. " Given the potential risks associated with WBC and the fact that WBC has not been approved as a medical treatment for any condition, the FDA recommends speaking to your health care provider before trying WBC.